It seems that many people are worried that we owe "all" our debt to China. Many people are concerned that China's economy is growing so fast. I've heard people talk about the possibility that China's Yuan currency might replace the US Dollar as the reserve currency. The fact that the USA (supposedly) imports "everything" from China is a major worry for some people as well. From the sound of it you'd think that we're just a few short days away from some guys in suits from China coming to knock on our national door and collectively evict us. Let me say something that can hopefully put all of that into some perspective: America is rich and China is poor. America is the wealthiest nation in the world. Period. The vast majority of the population of China still lives in rural farming villages. 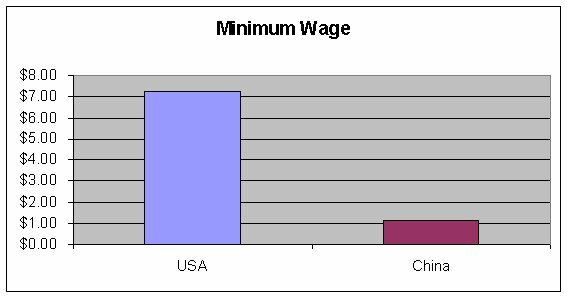 The middle class in China has grown considerably in the past couple decades but wages are still very low compared to Western standards and far below our minimum wage. Obviously there are rich people in China and poor people in America. As an American citizen you may not feel wealthy if you yourself are poor. Maybe you're in debt and you feel poor but you're still better off than most people in China. But for this article I'm not talking about individuals however, so don't get me wrong. I'm talking about the economies of the nation of America and the nation of China as a whole. Individual income levels don't exactly capture wealth but theres a good correlation. So its useful to look at incomes. 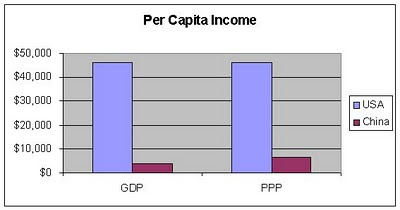 One measure of incomes is GDP per capita. As of 2009 the world bank listed the US at $46,381 while China was at $3,678. 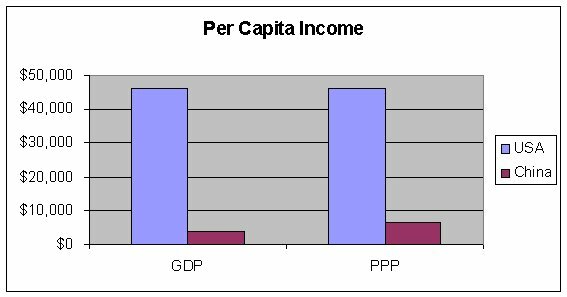 Or looking at PPP income the US is at $46,381 and China is at $6,567, Either way you look at it, its clear that the income levels per capita are considerably higher in the USA than China. The minimum wage in the USA is now $7.25 per hour. In January the NY Times reported that temp. factory workers were making $1.17 an hour in China. Incomes in China are to 8-15% of American levels. Its a bit hard to find information on net worth in China or for the nation of China as a whole. I found one report that relates to the topic: The World Distribution of Household Wealth . However the report is from 2006 and based on data from 2000 so its a little bit dated. (If you find better or more current data please let me know) I'm going to work with the assumption that the world distribution of wealth has not changed radically in the past 10 years. I'm sure there has been some shift in wealth distribution but not likely enough to alter the picture that much. Look at Table 10b : "Global wealth distribution per country" in the report it says that the share of global wealth each country controls. USA 32.6% and China at 2.6% So the USA holds about 1/3 of the worlds total wealth. While China has just 2.6% of all the wealth. If you break it down per person then the difference is even starker. The wealth per person in USA is $201,319 and in China its $3,885. Now that information is 10 years out of date, but its the latest I can find that breaks it down this way. Balance Sheet of American Households There we see that American households have assets of $68 trillion and liabilities of $14 trillion giving us a net worth of $54 trillion. Whether you look at income levels or total net worth levels the data I find shows that America is many times more prosperous and wealthy than China. Bottom line: Lets keep things in perspective. American wages and total wealth are considerably larger than China's.